This post will be a little off my normal topics, in that there will no augmented reality and no computers (although I did make some nice 3D models that I’ll link to later). It is about technology, but mostly about prehistoric technology. I have spent the last four days on a prehistoric metallurgy weekend, run by Fergus Milton and Dr. Simon Timberlake at Butser Ancient Farm in Hampshire. 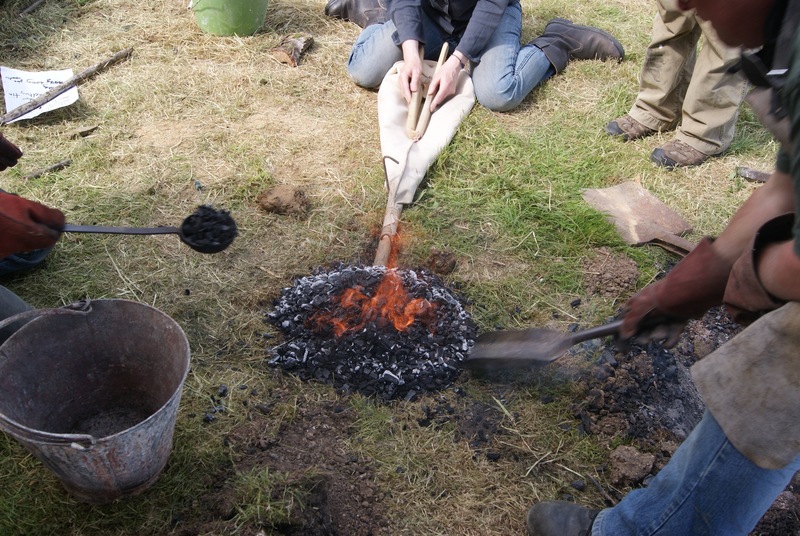 The aim of the course was to introduce us to the basics of prehistoric metallurgy and then teach us the practical skills so that we could take the process all the way from breaking the ore to casting an axe. I decided to take part in the course, not because I am focusing on the techniques of Bronze Age metallurgy, but because the site that I am looking at on Bodmin Moor was very likely to have been created to work the nearby tin sources and I wanted to know how they would have done it and what it would have felt like. I have read quite a bit around the subject, and have a good idea of the steps involved, but it wasn’t enough. As with all of my work, I am interested in the human experience of a landscape or an activity and find it is necessary to get my hands dirty to see and feel what smelting is like – something you can’t get from just reading about it. The course was quite archaeology focused, and being at Butser Ancient Farm meant there was also a large element of experimentation – rather than just demonstration. We were encouraged to try out different ideas and set up experiments based on our own research aims. The best part for me was that we made every part of the furnace and refractories (tuyeres, crucibles, collecting pots, etc.) 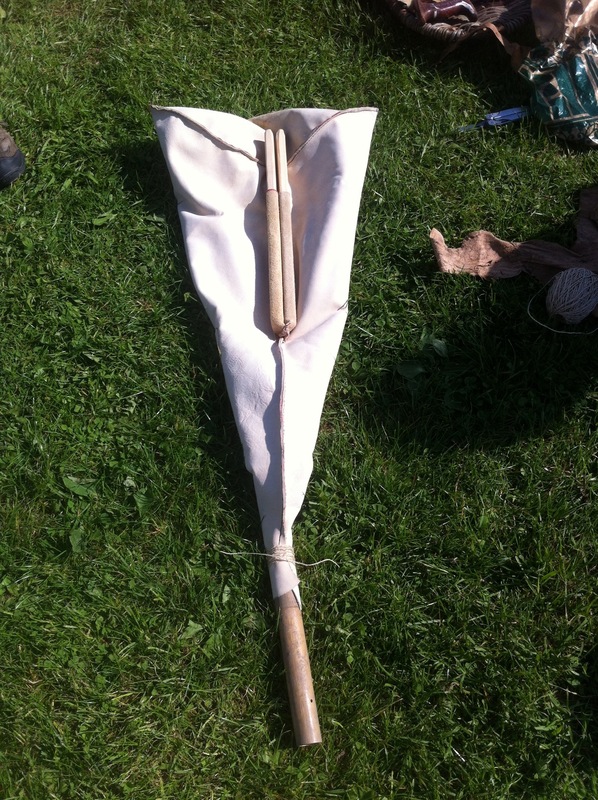 ourselves – we even hand-stitched our own bellows. After making our refractories we set to digging the furnaces, my group decided to dig a bank furnace and a bowl furnace. As can be seen from this 3D model the bank furnace is unsurprisingly dug down into a bank of earth with a horizontal passage dug into the shaft to hold the tuyere and bellows. 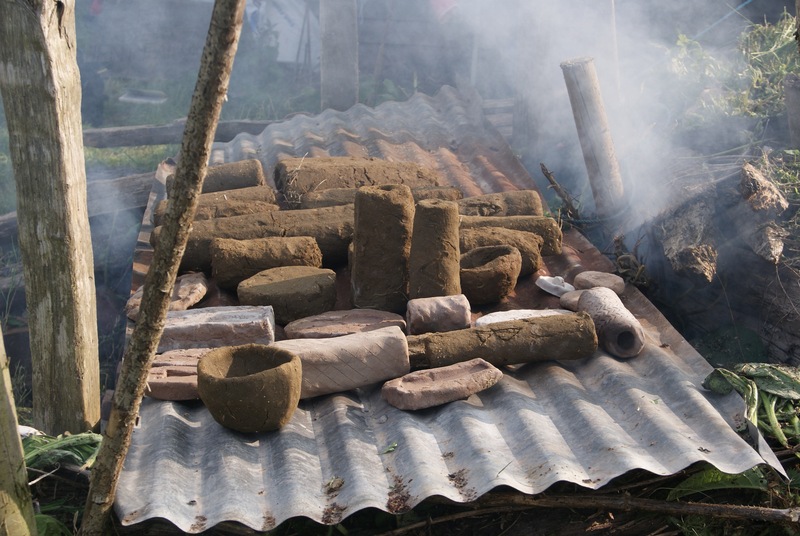 In contrast, the bowl furnace is a simple bowl dug out of the ground lined with a thin layer of clay, with a slightly sloping passage to hold the bellows and tuyere. In order to fire the furnaces up, all that is needed is a small fire in the bottom of the furnace which is slowly covered with charcoal until the furnace is entirely full. Obviously the bellows need to be continually pumped to get some oxygen into the fire under the charcoal. The ore is prepared for smelting using a beneficiation mortar (in our case we used a granite mortar which was probably originally used for grinding flour). Essentially it is as easy as smashing a few rocks and then grinding them down to powder using a stone hammer. This, perhaps weirdly, is the part of the process I was most interested in. I believe that the Bronze Age inhabitants of Leskernick Hill were collected and crushing cassiterite (tin-stone) on-site and I wanted to see how hard it was to do and how long it would take. Simon had some streamed Cornish cassiterite with him and so I got to have a go at crushing it to fine powder. It was remarkably easy and took very little time and effort to go from the rock itself to the powder ready for smelting. The mortar we were using had smooth sides and so the tinstone kept skating up the sides and escaping onto the floor, but perhaps this might have been prevented if we were using a mortar with straighter sides. As can be seen from the 3D model above, once the ore was crushed we loaded it into a hand-made crucible, ready for smelting. 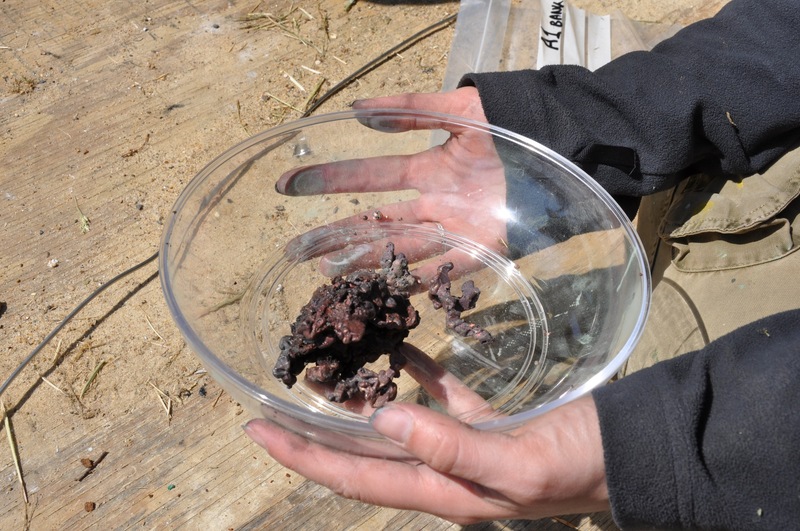 This crucible was filled with a mixture of cassiterite dust and malachite (copper-bearing ore) dust in an attempt to co-smelt them creating a ‘one-step bronze’. The mortar is stained green in this case from crushing up the malachite. Unfortunately on this experiment the hand-made crucible cracked in the furnace and so the one-step bronze leaked out and we eventually found it at the bottom of the furnace. We had also put a layer of crushed malachite directly into the furnace, which smelted away nicely and mingled with the leaked bronze to create a big lump of slightly tinned copper. Working my way through the entire process of metallurgy (minus the mining/collecting of the ore or the making of the charcoal) made me appreciate actually how surprisingly easy the whole thing is – and equally what rather unremarkable archaeological remains it produces. This is especially true of our bowl furnace, which when burnt out looked almost exactly like a hearth, complete with burnt ceramic material that one could easily mistake for simple prehistoric pottery. It makes me wonder how many smelting sites may have been misidentified as hearths. After this weekend I would happy to build a small furnace in my back garden and smelt some copper, and I wonder if the smelting furnaces of the Bronze Age were similar, small bowl furnaces in or around the family home. We undertook a total of 5 smelts and a couple of castings over the weekend, with varying levels of success. Even with the professionals there (Simon and Fergus) things did not always go to plan (crucibles broke, furnaces didn’t heat up enough, molten metal was spilled on the ground) but this, for me, was the key to the whole experience. While the entire process was much easier than I had first imagined, there was still effort involved in smelting a relatively small amount of metal. These mistakes and accidents would have happened in antiquity as well and so even when a whole smelt of tin vapourised to nothing due to the furnace being too hot, I didn’t really regret the 2 hours spent bellowing and in fact felt a little closer to the frustration that might have been felt by the inhabitants of Bronze Age Leskernick Hill. Although I know the chemistry behind the smelting process (just about!) I was dumbstruck by the magical process of turning rock to metal. We literally sprinkling crushed malachite into the furnace and covered it with charcoal, heated it and then found a lump of copper at the bottom of the furnace. It was quite a powerful experience, and one I am sure would not have been lost on the early prehistoric smelters. This whole weekend has made me realise that just as it is important to walk the hills of Bodmin Moor in order to really get a feeling for what it is like to inhabit the place, it is equally important to build a furnace, crush ore and smelt it to metal in order to find out what it is like to inhabit the activities as well. Of course experimental archaeologists have been doing this for years, but just one weekend of it has already changed the way I am thinking about some of my evidence and will almost certainly have a big influence on at least one chapter of my PhD.